AUTO Shinken Hissatsu: [SB1] When this unit is placed on G, you may pay the cost. If you do, this unit gets Shield +10000 until end of battle. 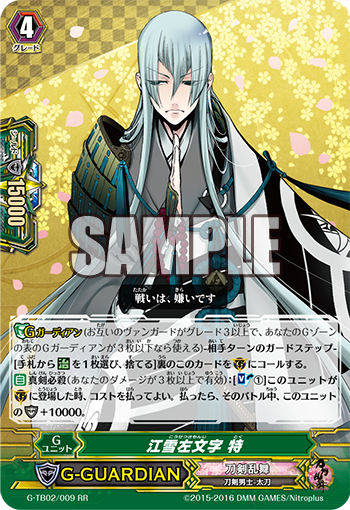 AUTO GB1 Shinken Hissatsu: When this unit intercepts, it gets Shield +15000 until end of battle. ACT [R] GB1: [CB1, put this unit into your soul] If you have 5 damage, choose 1 of your units, and it gets Power +5000/critical +1 until end of turn.